We are a group of sixth graders at Strong Elementary School in Strong, Maine. We love getting outdoors and doing activities like hiking, hunting, fishing, snowshoeing, skiing, and snowmobiling. For most of our years in middle school, our science and physical education teachers have been taking classes outside to the trail beside a stream located behind our school. Last year, we were doing a problem-solving project in social studies and our team chose to solve the problem of access to the trail and stream. It’s an issue because parts of the trail are hard to walk on if you are small or younger (we have Pre-K in our school), and also if you happen to be on crutches or in a wheelchair. Our goal is to improve access to the trail and stream area so that all of the students at our school can get back to the stream and learn about nature, specifically: ecosystems, invasive species, local birds, local mammals, and their habitats, as well as learn about watersheds and water quality. Ideally, we will first improve the trail by cleaning it up and leveling the ground where needed. Next, we hope to post three signs with information about local species of plants and birds, water quality, and invasive species. We plan to update the information on the signs as we learn by performing field studies and observations on a regular basis on the trail and in the stream. With our proposed project in mind, we decided to apply to the Natural Resource Council of Maine Engaging Middle School Students in Protecting the Nature of Maine program grant and were luckily awarded! When we applied for the grant, we had estimated the cost of pea gravel for an improved trail and lumber for the cedar posts for the signs. We have made a winter observation and continuously taken field notes since we began the project in January. Our observations raised some questions about the stream and about how we will choose to implement our project. As we continued to think about these questions, a teacher at our school, Mrs. Stanley, looked up information for us about who owns the property abutting the school property, and precisely how much land the school owns. It turns out that the school owns the land right down to the water’s edge. Also, we own a wide swath of land on either side of the school. 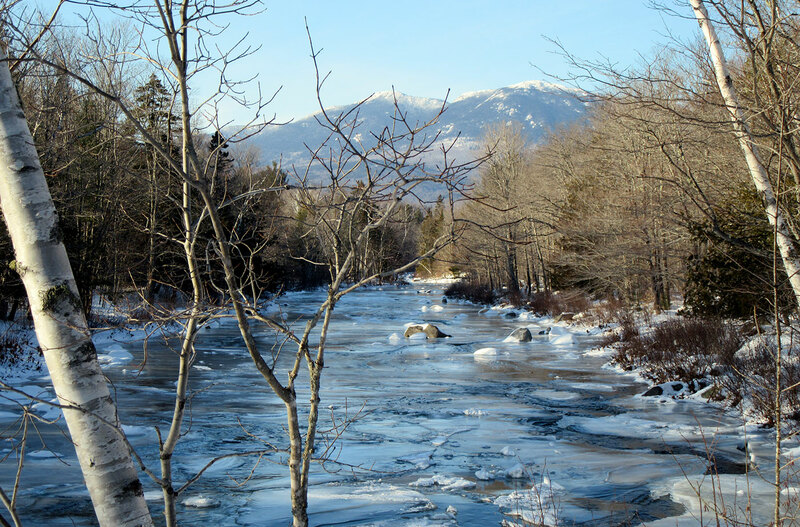 We learned that the stream is named Valley Brook, and it flows from the Carrabassett River, and flows into (feeds) the Sandy River. We have a goal of talking with the science classes who have previously studied invasive species within the stream, using what they have discovered and posting that information on a sign so that the community will start to learn about how to preserve the wildlife in the stream area. We also hope that the community and our school will begin to enjoy using the site because of the trial and the signs, and the improved access to the area! Conditions: sunny, cold (18F) and with a gusty wind blowing at times. Snowfall from two days earlier in the amount of 16 inches resulted in complete snow cover of the trail and stream area. The snow is light and airy. A snowmobile had set a track around the school fields and along the site of our future nature trail. From the evidence of the track, it appeared to be from the previous day, Monday. Deer tracks were observed near the stream’s edge and on top of the frozen parts of the stream. Easily five tracks were seen, the size of the tracks made us assume that there were some larger bucks in the area, (2) and a separate group of two does and several young. We also saw some squirrel tracks near the water’s edge. The deer were moving toward the open water in the middle of the stream. The tracks were fresh in the new deeper snow. They appeared to have been made today. We did not observe any bird life or marine life today. We noted that there are several species of trees along the trail, and we’d like to know exactly which species they are, so we plan to take photos and find out. The snowmobile track made it easier for us to walk along the trail area, however, we wonder about the impact on wildlife of the snow mobile if this is a heavily used track for ATVs. We noted a home or camp across the stream. We wonder if they have a septic field near the stream and what the impact is to the watershed. Why are the deer choosing this as a winter habitat area? Why are there not more birds around during the day? Will the snowmobile track be a problem for our outdoor classroom? Is the land posted for hunting and fishing, and ATV use? What are the tree species in the area? What are some invasive species in the area? What kinds of effluents are present into the stream? What is the watershed situation in the area? Where does this stream go and what is its role in the watershed?